The biscuit at the Island Creek Oyster Bar was perfect. Browned and crispy on the exterior. The inside was warm, moist and tender as only a baker who knows how to properly fold in the butter can create. But what had me unable to stop devouring it was the molten honey that oozed down the top. One bite and I realized there was another flavor that I couldn't place. Anise? Ginger? Finally, the waitress revealed the unexpected taste: rosemary. Brilliant. My oysters were fantastic, too; don't get me wrong. I find it so compelling that 6 oysters can taste so completely different. My oyster vocabulary is too limited to be able to distinguish each in words. But I can say this: the Misty Point from Pope's Bay, Virginia tasted of pure ocean. The Blue Pool from Lillywaup, Washington was buttery, creamy. The Umami from Narragansett Bay, Rhode Island had a totally different texture: less plump, longer. As much as I try, I don't really enjoy mussels. I tried them here, though, sitting within a lemongrass, chili and and lime broth. They were fine, but I am still not compelled to order them again. However, we loved the Steamed Duxbury Littlenecks. I typically have steamers, and a few bites are more than enough. However, these steamed littlenecks, having soaked up the salty, smokiness of lardons and Pilsner were fabulous. The servers were kind enough to offer us a bite of their silky house cured Idaho red trout. I adored the combination with a tart orange to offset the rich nature of the fish. My dining companion, though, passed, preferring the fish on its own merits. Having enjoyed baked beans at the Maine Diner and Chancey Creek, I tried them here, too. These were more simplistic, tasting of brown sugar, rather than deep molasses. Ultimately, they just weren't as special as, say, that biscuit. I was smitten with the drink menu as well, hard pressed to choose between a drink with homemade Rhubarb vermouth, another with my favorite Aperol. I loved my final choice: the Royal Bermuda Yacht Club made with Berkshire Rub, fresh lime, bitter orange and homemade falernum-a fabulous sugar syrup with cloves and allspice. So will I be back? For the food perhaps. The atmosphere, full of beautiful people, isn't quite my style. 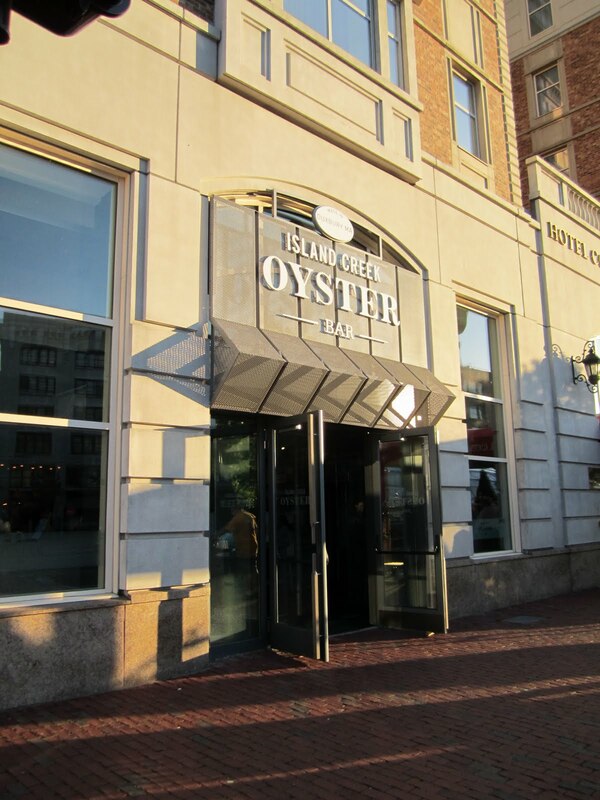 And, truth be told, I prefer the warm, comfortable atmosphere of Lineage where I can still get Island Creek Oysters. But for those biscuits...maybe! I've been here while passing through Boston earlier this summer. 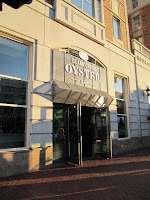 Great Oysters and I can't wait to go back!